Well kids…when FRESH salmon fillets are on sale for $2.99/lb…there is just no passing that up! I do believe I had to pick my jaw up off the ground while standing in front of the fresh fish counter! I have N-E-V-E-R seen such low prices for fresh salmon fillets! So grilled salmon it is! 1 tsp lemon pepper seasonings (free) On sale for $1, used $1 coupon = Free! Season salmon fillet with lemon pepper seasonings. Grill until fillet is no longer pink in the middle and fish has completely cooked through. Wash and slice squash into circles. Steam in stovetop steamer for 4-5 minutes, or until squash flesh becomes opaque. Season with salt and pepper to taste. 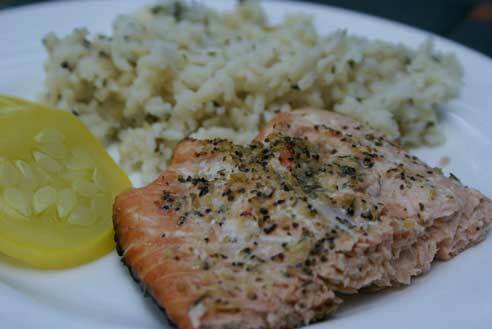 Serve Lemon Pepper Salmon with Steamed Squash and Rice with Garden Greens. You are a magician, I can’t believe you found salmon for $2.99! Yum! Magician, no! Just paying close attention to the ads!!! I couldn’t believe it either! This is AWESOME! And looks soooo yummy! Thanks for the tip!!!!!!! My brother-in-law brought salmon to our 4th of July cookout. He grilled it and it was so yummy! This looks great. We hit up the salmon deal and stirfried it with some leftover snow peas from the farmers market and some teriyaki sauce. Awesome! That is an incredible deal on salmon!! Kroger…Dayton, OH! I couldn’t believe it either! I guess finding useful, reliable ifrnomaiton on the internet isn’t hopeless after all. I was pleasantly surprised at the frozen salmon that I got at Aldi- last night we thawed it out and ended up broiling it instead of grilling because we ran out of propane. It’s only 3.49 for a pound of wild salmon, which is I guess supposed to be better for you than farmed salmon (more omega-3’s)… I will try to make fish part of our frugal eating plans from now on! Thanks for the great recipes and!